To make any sense of death statistics, we have to ask, “Compared to what?” Because if we compare deaths by firearms to other causes of death, the picture is very, very different from the doomsday fear mongering scenarios CNN and other gun control pushers have whipped up into a nationwide frenzy. In fact, as the following infographic shows, doctors kill 2,450% more Americans than all gun-related deaths combined. It’s true: You are 64 times more likely to be killed by your doctor than by someone else wielding a gun. That’s because 19,766 of the total 31,940 gun deaths in the USA (in the year 2011) were suicides. So the actual number of deaths from other people shooting you is only 12,174. 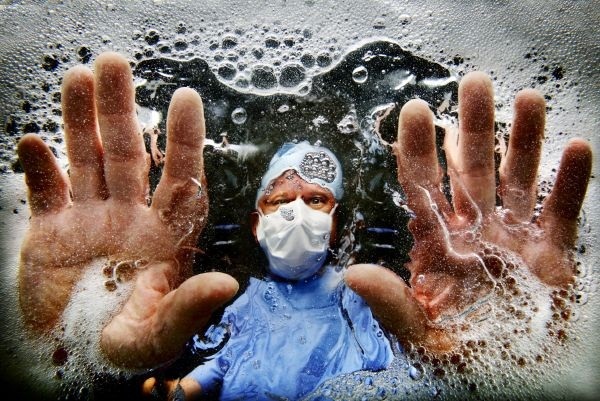 Doctors, comparatively, kill 783,936 people each year, which is 64 times higher than 12,174. Doctors shoot you not with bullets, but with vaccines, chemotherapy and pharmaceuticals… all of which turn out to be FAR more deadly than guns. This is especially amazing, given that there are just under 700,000 doctors in America, while there are roughly about 80 million gun owners in America. How do 700,000 doctors manage to kill 783,936 people each year (that’s over one death per doctor), while 80 million gun owners kill only 31,940? Because owning a gun is orders of magnitude safer than “practicing” medicine! 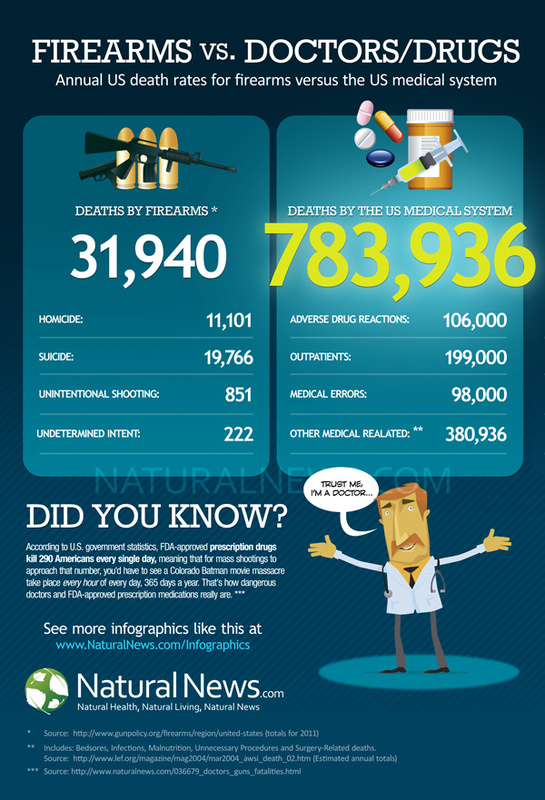 As the infographic explains, you are over three times more likely to be killed by a drug side effect than a firearm. On the firearms side of things, you are almost twice as likely to be killed by YOURSELF than by someone else using a gun. But even this number can’t be blamed on guns themselves, because if people really want to commit suicide, they will find other ways to accomplish it (such as jumping off buildings or bridges). There’s zero talk about making medications safer, or reducing the number of people who are medicated every day in America. There’s no mention of the astonishing fact that surgical procedures do not need to be proven safe and effective before being tried on patients. Surgery in America is, in effect, a grand experiment often conducted with little or no scientific support. There’s no discussion of the fact that psychiatric drugs promote violent shootings as we’ve seen over and over again across America. Nope, the entire focus is on how BAD guns are, while the government simultaneously promotes how GOOD vaccines are! …and chemotherapy, surgery, pharmaceuticals and everything else that’s killing us en masse. Hundreds of people are killed every single day across U.S. hospitals from pharmaceutical side effects alone. On top of that, hospitals are killing people with superbug infections, fouled up surgeries, and failed heart stents, among other deadly problems. Sandy Hook was the tragedy the government wanted you to see. But they didn’t want you to pay attention to all the deaths happening elsewhere — in far greater numbers — such as at hospitals and via pharmacies. Because all those deaths overseen by doctors and pharmacists are making billions of dollars for the corrupt, criminally-run pharmaceutical industry and the for-profit, corporate-driven health care complex. While Sandy Hook was mass murder, the U.S. health care system is practically a holocaust. In fact, the U.S. health care system has killed more people than Adolf Hitler — by far! Spread the word: If we want to save lives, the most important place to start is at the doctors and drug companies. They are dealers of death who have been granted obscene monopolies by the FDA and state medical boards. Until their stranglehold on U.S. health care is finally broken, millions more innocent Americans will die at the hands of doctors, surgeons and pharmacists. Any straight thinking human, either pro-gun or anti-gun will find this comparison outrageous. Let’s take your logic a bit further and ban doctors that attempt risky but necessary procedures or prescribe drugs that might have side effects. How do you think the world will look in a year’s time? What afoolish article. The comparisons idea is simply a canard with no value whatsoever. For instance “childbirth causes death” yes that may happen but the sarcastic answer “so are we supposed to prohibit pregnancy” doesn’t help the argument at all. The answer is of course, no we don’t prohibit pregnacy we increase healthcare and medical services to prevent childbirth deaths. The same way guns which are designed to cause death need common sense laws to prevent death from being so easily available to everyone.